She runs a company called Golden Tours and a number of companies. Golden tours – she is the finance director as well as a director and company secretary. She also run a charity company named Golden Tours Foundation . this is mainly for the education on children and adults who are studying Hinduism in England and in India. She is a patron in India in a girls school in Ahmedabad. She is also involved in running the Diwali In Trafalgar Square in UK. World War One and Two where – working with the UK Museums. And lastly with the Swaminarayan Mandir in Neasden. 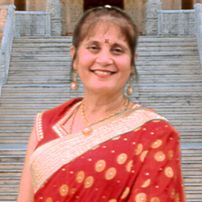 Her passion of YOGA is immense and she teaches Yoga to the needy – old and young and others in groups in centres.